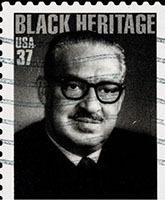 Thurgood Marshall lived from 1908 to 1993. He was the grandson of a black slave and was born in the city of Baltimore, Maryland, USA. In 1933, he graduated first in his class in the School of Law at Howard University. He started a private law practice in Baltimore and he began a twenty-five year affiliation with the National Association for the Advancement of Colored People (NAACP). In 1936 he became part of the national staff of the NAACP. A central ingredient of his legal career was his dedication to fighting injustice. This reflected itself in his involvement in civil rights cases, many of which were high-profile and of considerable importance. His most famous case was that of Brown vs Board of Topeka (1954). In this case the ‘separate but equal’ public education, permitted in the earlier case of Plessy v Ferguson (1896), was held not to be and never could be truly equal, and was in breach of the Fourteenth Amendment of the US Constitution because of its racially discriminatory character. In 1961 Marshall was appointed to the Court of Appeals in the Second Circuit by President Kennedy. In 1965 he became the first African American to be appointed Solicitor-General of the United States and in 1967 he was appointed as a Justice of the Supreme Court, again becoming the first African-American to fill such a post. Marshall served on the Court for the next 24 years. There he made important contributions to jurisprudence in a range of areas, most particularly those of civil rights and criminal procedure. He was part of the majorities that ruled in favour of the right to abortion in the case of Roe vs Wade (1973) and in declaring that the death penalty constituted cruel and unusual punishment in the case of Furman vs Georgia (1972). Thurgood Marshall stands alongside Martin Luther King Jr. and Malcolm X as one of the most important figures in the American Civil Rights Movement. He is inspiring for two reasons. The first was his use of the law to overcome discrimination and injustice more generally as exemplified by the cases and causes with which he was involved. The second was his achievement of overcoming race discriminatory barriers to career progression, by becoming the first African-American Solicitor-General and then Supreme Court Judge. For both reasons he inspires lawyers and legal campaigners to develop their careers to rise to the challenges associated with the pursuit of the rule of law and social justice. Nominated by Abdul Aziz, PGDL/CPE Graduate, and chosen for the Inspired by Law: Gallery of Lawyers and Legal Campaigners in 2016.